The craze is real, Pokemon GO is exploding in popularity! It has already overtaken the most popular mobile dating app out there (Tinder) and is hot on the heels of mega-social giant Twitter for most daily active users. And it only launched last week! Let me repeat that. It launched LAST WEEK. Twitter has been around for 5 years and no social platform has ever experienced this type of immediate popularity. Personally I love Pokemon. I was the perfect age for the original pokemon heyday in the mid to late 90’s. I got the cards, the Game Boy games, and my brothers and I would go on wild adventures capturing our own imaginary Pokemon. So for me, the major hit of nostalgia coupled perfectly with the need to “catch ‘em all” all in an app. Not to mention my wife’s own obsession: she has more Pokemon than I do and is a higher level than I am! So, being a marketer I wondered how local businesses could take advantage of this craze. After some Google research and some strategic meetings with work colleagues, here are some great ideas for how your business can lure in customers with Pokemon GO. 1. Using Lures – Jason Evangelho at Forbes Magazine online published a great article on how using a “lure module” at your business can be a great way to attract customers. There are pre-determined areas built in by the game developers called “PokeStops” and other places called “Gyms” that reflect real world places of interest. Some examples are local monuments, religious establishments, even a tree in a park, as well as other interesting areas. In this screenshot you’ll see an example of both. The Gym has the giant Pokemon called Nidoking on top of it. Aside from setting up a remote kiosk with banners and a table, there isn’t much you can do as a business with these locations. And bombarding players outside your business is not recommended. But, we have a solution for you that called a PokeStop. As seen at the top of this screenshot, the blue icon with pink around it is your new money maker. For just $0.99, you can turn that PokeStop into a beacon for trainers (players) by activating a lure module. Within the game, lure modules attract wild Pokemon to them for 30 minutes. In the real word, this brings players to your location where they sit and stay for the next half hour trying to catch that illusive Lickitung. (Check out my Instagram post to see the madness of a lure in action! )Establish an exclusive offer just for Pokemon players and watch them be lured to your business. You can offer a discount or goods or services, or even offer a free sample. There are so many possibilities, and all for less than a buck. 2. Name That Pokemon – Once players catch a Pokemon, they can name it in their app. Request the players in your area to name their Pokemon after your establishment and offer them a reward! Encourage them on your social media outlets to be creative and possibly give a grand prize for the most unique name using your business name or something related to it! Someday he’ll be a Oozlefree! 3. Join the Wave – My friends over at Wallaroo Media had a great idea of adding a sign to your storefront to let trainers (think: potential customers) know what types of Pokemon have been found at your business. This can encourage trainers to hang out for a bit, letting you market to them, all while playing a game that they love! These are just a few ideas that we had, and if Nintendo is smart, they will be taking advantage of the monetization possibilities within the game*. Sponsored gyms or PokeStops, safari expeditions – like in the video game – or even sponsored Pokemon tournaments are just the tip of the “Pokemon possibility” iceberg. If you are a business, you need to catch the wave this extremely popular game is creating, all with a fun and interactive way to build your brand. 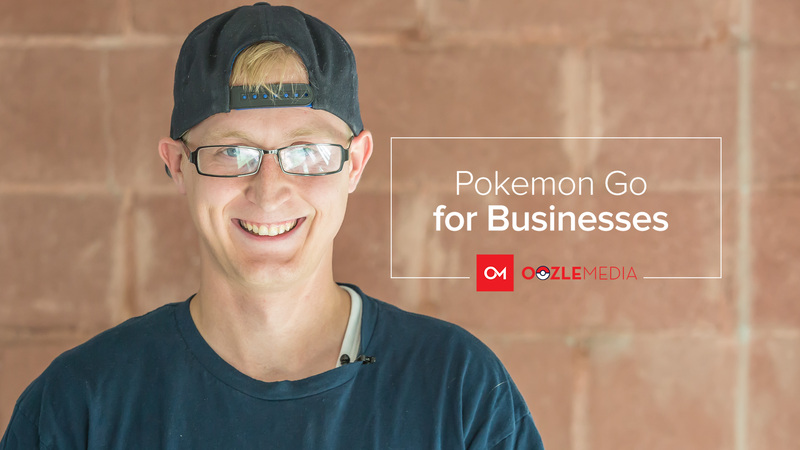 Pokemon GO is getting people out into the streets and now you can get them into your business. Do something now to let these people take advantage of their adventures and benefit your business. Let us know what you think of these ideas. If you have success stories on this unique “return on investment” opportunity, we’d love to hear about them too! If you are looking for a digital marketing agency that executes on creativity, new technological trends, Google algorithms, and can help you ride ups and downs of social media trends, Oozle Media is the agency for your needs! * After posting this several media outlets reported that Niantic Labs (the company who developed the game) will allow companies to become sponsored locations. There is no timetable for when this will roll out, but I’m sure this won’t be the only update that they have.